Recreates the real-life Saturn V rocket used to power the Apollo moon landing! Glue and paint required, not included. 1:200 scale kit measures 20-inches long when assembled. There are few real-life spacecraft more iconic and world-renowned than the Saturn V rocket used to power the Apollo moon landing. 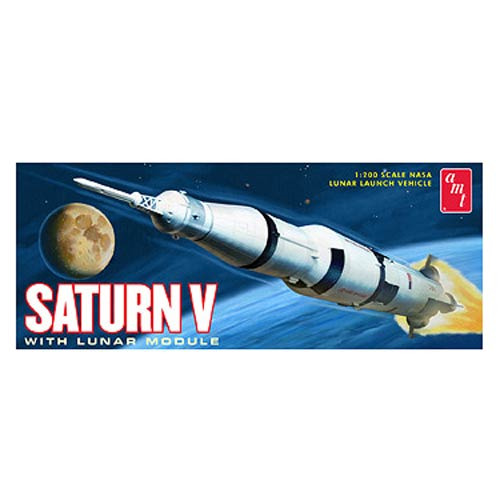 This Saturn V Rocket with Lunar Module 1:200 Scale Model Kit recreates the rocket in authentic detail. The kit is engineered to allow friction fit joints between stages and includes the Eagle lunar landing module. The rocket measures over 20-inches long when assembled. Authentic marking decals are included to complete the model. Glue and paint required, not included. Skill level 2. Ages 10 and up.